As Enterprise Connect co-chair Beth Schultz mentioned yesterday in her EC19 day-one newsletter post, communications continue to evolve -- the technologies themselves as well as the end user behaviors and enterprise strategies built around them. With all this change in the air, it can be challenging to navigate your way to success, whether you’re the vendor working to create the collaboration-enabling tech solutions, or an end user enterprise working to develop your collaboration strategy and adopt solutions that work best for you. But success on these fronts sure is in the air at Enterprise Connect -- it’s all around us! 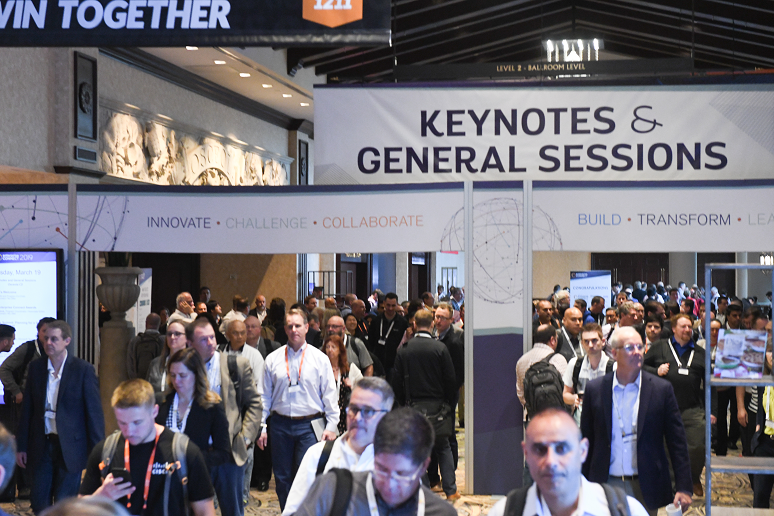 Day two kicked off with the Best of Enterprise Connect Award presentations, which recognizes exhibitors with innovative products and services that advance the enterprise communications and collaboration industry. This year we expanded the program to include four new breakout category awards in addition to the Overall Best of EC award. Microsoft (booth 507) took top honors, earning the Best of Enterprise Connect Overall Award for its Microsoft Teams for firstline workers and new workspaces solution. In our Best Application of Artificial Intelligence Category Award, Amazon Web Services (AWS) and Optanix tied for the win, and in our Best Innovation for Collaboration Category Award, Mio took home the prize. For the Best Upgrade to an Existing Product Category Award, AWS and Microsoft tied for the win, and for the Best Communications/Collaboration Device Category Award, Poly (previously Plantronics-Polycom) won. Like I said, winning is in the air! After our award presentation ceremony, we heard from enterprise IT decision makers on how they are finding success in keeping up with that ever-evolving communications/collaboration environment. In our annual Enterprise Summit, panelists from Conde Nast, Continental AG, Hertz, Northwestern Mutual, Paychex, and Waste Management shared their strategies to deliver enabling technologies to their end users while remaining agile enough to be able to respond to that continuous change. We also heard from our first set of three keynoters -- Microsoft, Walmart, and AWS (Cisco and Google are up tomorrow!). Microsoft and AWS each announced several new offerings. On No Jitter, one of the independent judges for our Best of EC Award program, Melissa Swartz, shared her observations from the evaluation process and gives some great insight into how Microsoft’s latest announcements are truly innovative. Separately, UC analyst and No Jitter contributor Zeus Kerravala gives a nice overview of how AWS’s latest announcements -- centered on AI packages for the company’s contact center solution, Amazon Connect, as well as new voice features for Chime -- show the company’s commitment to growth in the enterprise communications space. So far, Enterprise Connect is full of winners -- and there’s much more to come! But if you’re not winning in collaboration quite yet, hopefully a week of learning in breakout sessions, hearing from peers, and getting briefings with exhibitors on the Expo floor can help get you on track. We hope you walk away from the event with fresh ideas and authoritative perspectives on here the industry and its technologies, services, and vendors are going and how you can navigate your way through it all to reach success. Here’s to another great day at Enterprise Connect!